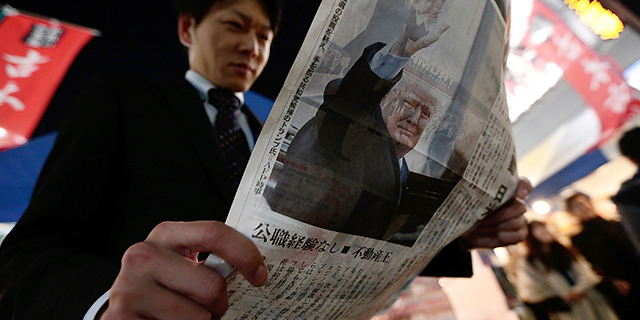 Substantial shares of people around the globe say they closely follow news about the United States, according to a new Pew Research Center report. Interest in news about the U.S. is highest in Canada, where 78% say they track it closely. Next highest is the Netherlands (75%), followed by some of America’s closest allies: Japan, Germany and Australia. Across 10 European nations, a median of 51% say they follow news about America closely. Many Latin Americans, on the other hand, are not particularly interested in what happens in the U.S. Roughly four-in-ten or fewer in Brazil, Colombia, Argentina, Chile and Peru follow U.S. news closely. However, a 55% majority of Mexicans follow American news closely. Besides the countries surveyed in Latin America, interest in U.S. news is lowest in Jordan (26%), Indonesia (29%), Hungary (32%) and Lebanon (34%). For the most part, people in the countries surveyed who have a favorable view of the U.S. are no more likely than those with an unfavorable view to closely follow events in the U.S. One exception is in Russia, where 57% of those with a favorable view of the U.S. follow U.S. news closely, compared with 44% among those with an unfavorable opinion. 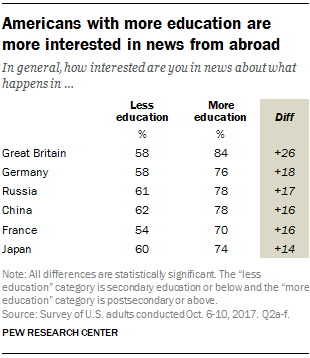 In many countries, interest in news about America is connected to educational attainment. In 24 of the 37 countries surveyed, those with more education are more likely to say they closely follow news about the U.S. than those with less education. And in 27 countries, those who say they like American pop culture, such as music, movies and TV, are also more likely to follow America-centric news. For their part, most Americans say they are interested in news about other major world powers. Nearly seven-in-ten Americans surveyed in the fall of 2017 say they are interested in what happens in Great Britain (69%), China (69%) and Russia (68%). And roughly two-thirds say the same about Germany and Japan (66% each). As with foreign interest in the U.S., Americans with more education are more likely than those with less education to express interest in the global powers tested. Mutual interest between publics in the U.S. and other major powers diverges in several cases. 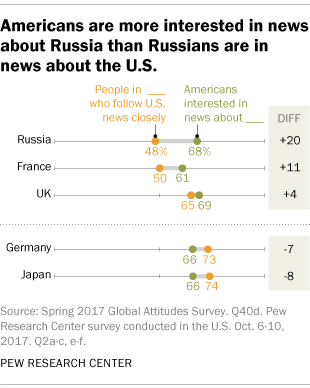 For example, while 68% of Americans say they are interested in news about Russia, only 48% of Russians say they closely follow news about the U.S. And while 61% of Americans are interested in news about France, just 50% of French people say they closely follow news about the U.S. 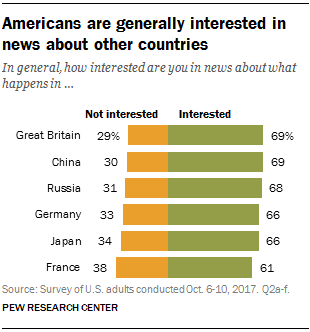 In the opposite direction, Germans and Japanese are more interested in news about the U.S. than Americans are about these key allies. Note: See full U.S. topline results and methodology here (PDF).